Hit It Farther! Hit It Straighter! 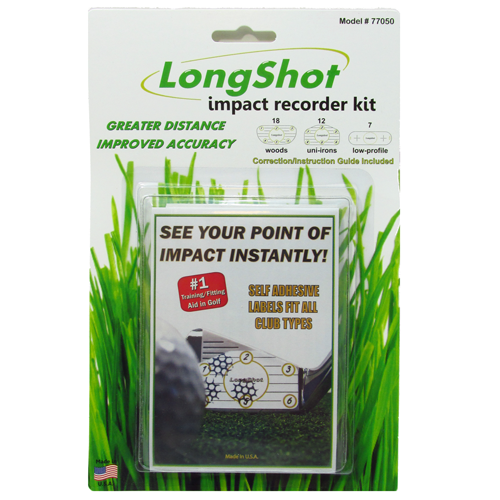 LongShot Impact Recorders transform your mis-hits into an education rather than frustration by helping you zero in on perfect "Sweet-Spot" contact. Each recorder is shaped to fit a club type; they are moisture resistant, add no weight and do not hinder ball to club contact or feel. Simply attach an Impact Recorder to any club (even you putter) and as you practice or play a normal round of golf, you will see your actual point of impact. This feedback eliminates guesswork and provides the basis for lasting improvement. The results will be greater distance, improved accuracy and important...lower scores! Each recorder produces an average of 4-8 accurate reading before replacement is needed...the most economical practice aid available!